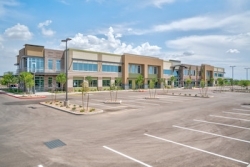 Tempe, AZ, April 02, 2019 --(PR.com)-- Menlo Group Commercial Real Estate announced today that Elevation Solar has signed a long-term lease at 2425 S. Stearman Dr., Ste. 220 in Chandler, Ariz. The 12,588 sq. ft. space will serve as the solar power company’s new headquarters. Stearman, LLC owns the property and was represented throughout the transaction by Kyle Campbell and Todd Noel of Colliers International. Tanner Milne, president and founder of Menlo Group, negotiated on behalf of Elevation Solar. “I love working with Elevation Solar and was excited to show them the possibilities of this space,” Milne said. “The Stearman will be a great home for their next phase of growth, and I can’t wait to see the things they do in their new headquarters."